Launch DVD Photo Slideshow. You have three ways to import photos to the slideshow software. Way1. Locate photos from your computer hard drive and drag them to "Album Photo" sub-tab. Way2. Put photos in a folder on your computer, locate the photo folder from "File Folder List Panel" and click it, then drag photos to "Album Photo" sub-tab. Or click "Add All" to add all photos in the folder. Way3. Click "Add" to locate photos on your computer and import them. After photos are imported, you can see the photo thumbnails in the main screen under "Album Photo" sub-tab. Now you can rotate photos and auto-adjust the exposure of photos. To delete a photos, right-click it first, then click "Remove". You can arrange photo order directly by dragging photos to places where you want to put them. Double-click a photo(Or click "Text" icon), the "Photo Configuration" window will show. 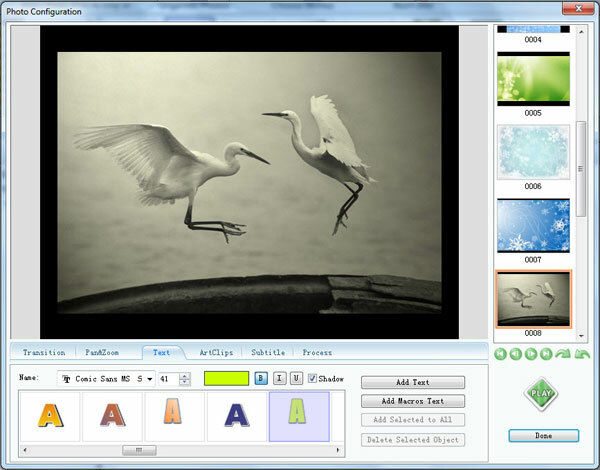 In this window, you can add text and subtitles on photos, decorate photos with art-clips, adjust Brightness/Contrast and Color Balance of photos, set transition and pan&zoom effects for each photo.